Droom is Motorplace Partner for Bigg Boss Season 12! Recently Droom was in news for announcing ₹400 crore as part of its marketing spend, which includes mass marketing, building, performance-based digital marketing, deals & promotions and CSR activities. Working on the same line, Droom has another good reason to grab your attention with its sponsorship of Bigg Boss Season 12 and the launch of its latest TVCs and digital advert. Yes, Droom is the motorplace partner for India’s most popular reality show, Bigg Boss season 12, which has already hit TV screens. Catch the fun and excitement around Droom’s Sponsorship of Bigg Boss and win a chance to visit the Bigg Boss house by participating in our contests. Check our Facebook, Twitter and Insta handles for the details. 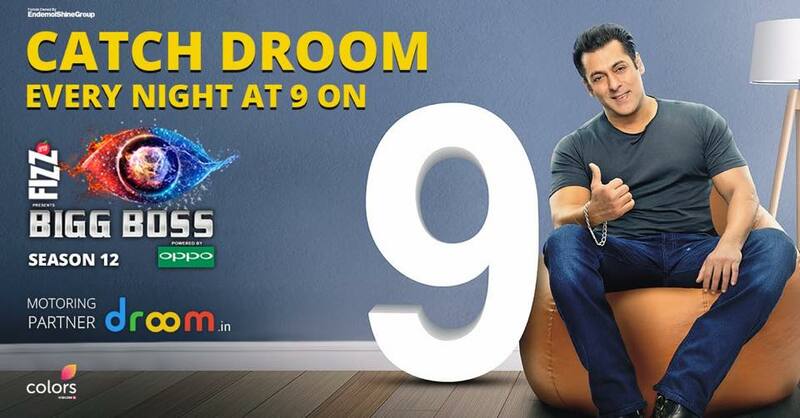 Not just the celebrity and commoner drama, but you can also watch the all-new, clutter-breaking Droom TV ads during Bigg Boss breaks every day at 9:00 p.m. The new Droom TVC celebrates the Used Gaadi Par Nai Wali Feeling with Baba Sehgal! In his much loved rapper avatar, Baba Sehgal raps the joy of owning a second hand that feels just like new. So, what are you waiting for? Experience the new way of buying vehicles for that nai waali feeling with Droom (Largest Online Selection | Loan, Insurance & RC Transfer | 21st Century Tools).